Start reading The Out-of-Sync Child Grows Up on your Kindle in under a minute. This book really opened my eyes to all of the ways in which sensory issues can make daily life more exhausting and difficult. As an adult with sensory over-responsiveness, I found it extremely helpful to hear about SPD in the context of older, more independent individuals. The stereotype of SPD is the non-communicative problem child and most books on SPD are geared towards parents dealing with young children. I identified with many of the stories in this book, and found some new ideas to incorporate into my daily life as well. The book explains a bit about the physiology of SPD without using overly arcane language, making it accessible and conversational. The chapters on relationships were particularly good and gave me a lot to think about. 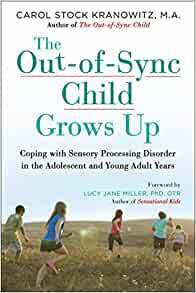 My one criticism of this book is that it does not really address adults with SPD, despite the title. It stops with adolescence, and doesn't exactly explain how people living on their own might face different challenges than teenagers and college students. I sort of felt like it assumes that there is no further development that takes place after adolescence. A future book might cover topics such as dealing with SPD in the midst of a career, raising a family, and looking towards retirement options. We've needed this book for years. These kids grow up but many of the symptoms do not go away. Still reading but Carol is an expert and I know there will be much to learn and understand from this book. 5.0 out of 5 starsIt’s going to be okay. Finally! The first book literally saved our lives - no one understood, not even doctors, teachers or speech therapists. This second book is just as excellent. I adore my son, who still struggles, but he is going to be ok. Thank you. Read it from cover to cover right away. A remarkable book bringing understanding, hope and help to SPD adolescents and young adults, and all who love them. The only book missing in my collection.m good content:) as an pedia consultant, provides better insights also for my clients as well. This book came so highly recommended. I was told to buy it by my childs neurologist and then again by Easterseals Autism Foundation. I am not finished reading it but there is so much about your own child that you arent even aware of. As your child grows up, the world is so confusing and help doesn't seem to be as available.